This post originally featured in the Wells Journal on Thursday 28 November 2013. I used to be something of a purist when it came to scones. The whole scone experience was more about the indulgence of the clotted cream and jam, rather than the scone itself. If I was being slightly adventurous, I might throw a few sultanas into the scone mixture. But since a) having children and b) becoming a food blogger, a new scone-shaped world has opened up to me, particularly the seemingly endless possibilities of the savoury scone. Savoury scones are a perfect standby snack for little ones (and adults) and I often make them for the children’s lunchboxes too. 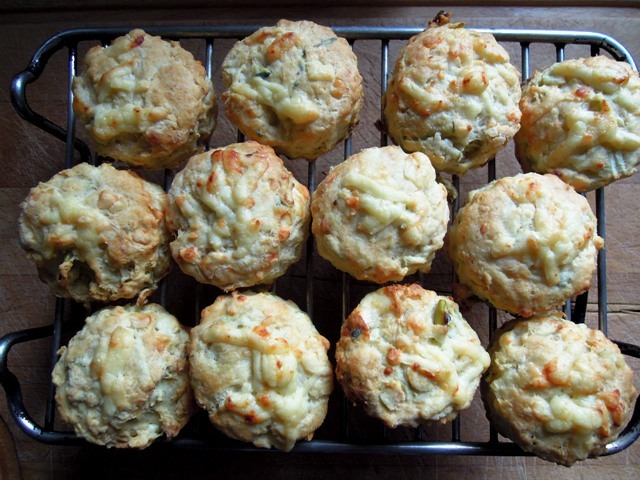 Courgette and cheese scones are favourites, as are butternut squash and red onion. Think of Somerset foods and Cheddar cheese and apples will no doubt come to mind. I know, I know – the produce of Somerset is so much more varied than this ubiquitous pairing, but you have to admit our apples and cheese are world-class. If you were at the Wells Food Festival back in September, you’ll have seen the crowds around the cheese stall; all due to the fine reputation of our local cheeses. 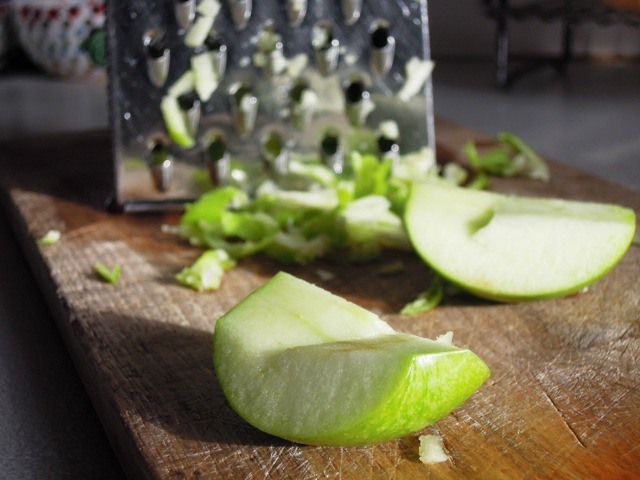 And what better to enjoy alongside your cheese than a crisp, flavourful apple. We are so lucky to have such a wonderful variety available to us here, although we should remember that more than 50 per cent of Somerset’s orchards have disappeared over the last 50 years. This is something a number of local growers and projects are working hard to turn around. 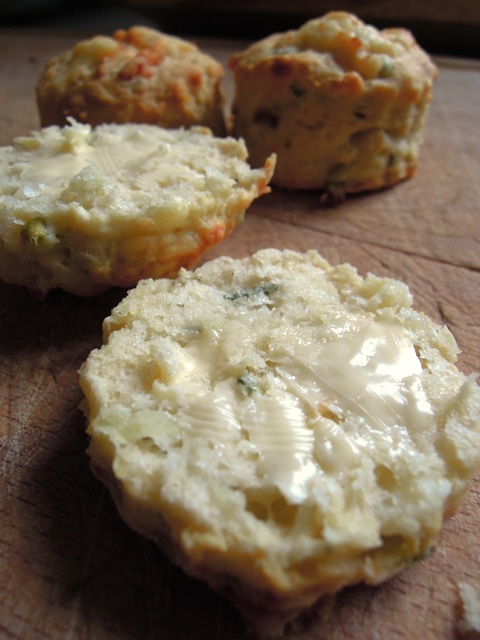 So, for a taste of Somerset in a scone, how about a tasty cheese and apple scone, using a mature local Cheddar and a generous sprinkling of fresh sage? They’re perfect cold in your packed lunch but even better served warm from the oven, with a little salted butter and some extra slices of cheese or maybe some cold meats. Grease a large baking sheet and cover with baking parchment. Pour the flour and baking powder into a large bowl and mix together. Chop the butter into cubes and rub it into the flour using your finger tips until it resembles breadcrumbs. Stir two-thirds of the cheese into the mixture, along with the sage and apple. Make a well in the middle of the mixture and pour in the beaten egg and milk. Use a knife to bring together into a soft dough. If it is too wet, add a little more flour. Lightly flour the work top. Roll out the dough to a 2cm thickness and use a pastry cutter to cut out your scones. Keep re-rolling the dough until it is all used up. Place the scones on the baking sheet spaced well apart. 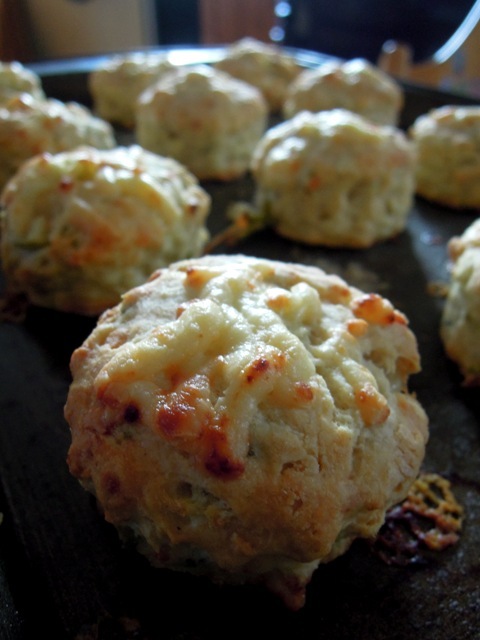 Sprinkle the scones with the remaining grated cheese and bake for around 15 minutes until golden. These scones are an ideal lunchbox filler and so I am entering them into this month’s Family Foodies challenge, which I just happen to be co-hosting with Lou over at Eat Your Veg. The theme this month is Lunchbox Ideas. As the scones also feature fresh sage, I’m entering them into November’s Cooking with Herbs challenge, hosted of course by Karen at Lavender & Lovage. And finally, as these scones feature local West Country Cheddar cheese and apples, I’m entering them into the Shop Local blogging challenge at Elizabeth’s Kitchen Diary. These look delicious! I would have never considered putting apples into a savory scone, but it’s such a great idea. It’s maybe down to the cold weather, but I’m looking at your photos and imagining the taste of apple and cheese scones with a bowl of homemade tomato soup! What a GREAT combination of flavours, and I am a BIG cheese scone addict, so these have been added to the list of “must make soon”! What a gorgeous recipe! Thank you for linking up with Shop Local and for writing about the plight of the Somerset orchards. This is just the sort of thing I’d like folk to highlight in their shop local posts, thank you! How tasty! I’ve pinned this for future reference. This is exactly what I would love to have in my lunchbox – or even better for a weekend ploughman style lunch. I love the cheese and apple combination and I love that you add sage to make it quite clear this is a savoury version – have got caught with apple and cheese recipes that are unexpectedly sweet.